I am participating in two online quilting bees for the first time this year. I’ve been assigned to Stash Bee’s Hive 7, and I’m in one of The Bee Hive’s USA swarms. In fact I am the swarm leader of The Bee Hive Mary USA. I’m new to quilting and even newer to blogging, but our swarm leader went MIA, so I stepped in with fear and trepidation! The January queen bee for our swarm in The Bee Hive is Patti, and I am so grateful for Patti stepping up and being willing to be first. We choose from 25 different block tutorials posted on The Bee Hive, and even if a previous month’s queen bee has chosen a certain block, it is perfectly fine to choose that block again when it is our turn to be queen bee. I will be queen bee in August, and I still don’t know what block I’m going to choose, but I have decided on a color scheme (to be revealed in late July!). 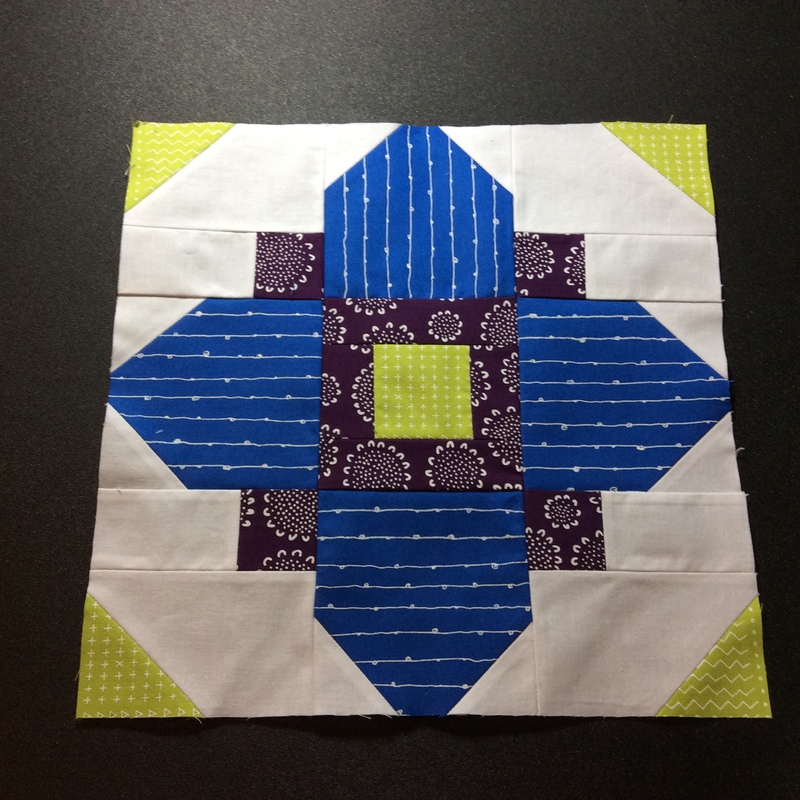 Patti chose the Quatrefoil block in blue, purple, lime, and white. 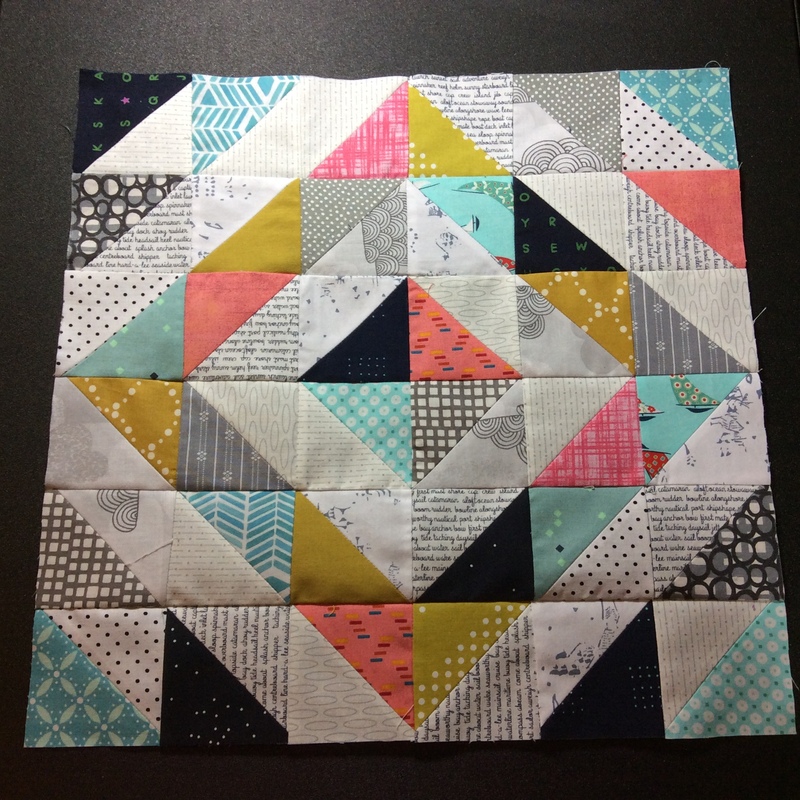 I decided to use Karen Lewis’ Blueberry Park fabrics for Patti’s block. Be sure to check out other Quatrefoil blocks made with Patti’s color scheme on Instagram at #BEEHIVESWARMMARYUSA. They all look awesome! For Stash Bee, the queen bee can choose any block tutorial that is freely available on the Internet or one that she has written herself. The blocks can be up to 16 1/2 inch unfinished. For January, our queen bee, Cyndi, (who is also our Hive Mama) asked us to make a scrappy diamond 15 1/2 inch unfinished block choosing the following colors: pink, mustard, navy, aqua, purple, kelly green, and grey along with low-volume fabrics. Cyndi wanted the block to be bright. The purples I had on hand were batiks which a lot of people don’t like, and I don’t have any kelly green, so I used the other five colors which gives it a more subdued look (which I like) but definitely is not as bright as many of other blocks posted on Hive 7 this month. I’ve never sewn this large of a block before. It is huge!!! I can’t wait to see what blocks we’ll be making for February! Linking up with Building Blocks Tuesday. This entry was posted in Quilting and tagged Stash Bee, The Bee Hive. Bookmark the permalink. Way to go for stepping up! I hope that you have a great year in both bees – your first blocks look wonderful. I’m sure your hive mates appreciate that you stepped in and will support you! It’ll be a great experience. Both blocks are wonderful. Good luck making your choices! These are lovely. I’ve never made either of them, you did a great job. Very nice!! They both seem complicated.